Based on the Victorian game of Word Making, Work Taking, ANAGRAM is a superb word game, exciting and challenging to play. 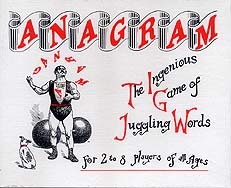 Players compete to collect as many words as possible, either by using new letters as they are revealed or by spotting Anagrams and poaching their opponents' words. Play is fast and furious and fortunes can change right up to the end!